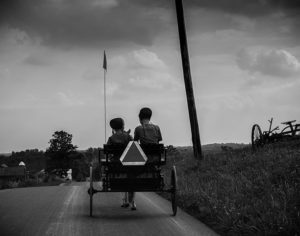 Did you know that most Amish children learn to speak English when they start attending school? Until then, most Amish children speak Pennsylvania Dutch at home. What else do Amish children learn at school? Besides the obvious of reading, writing, and arithmetic (not sung to the tune of a hickory stick…I couldn’t help myself, sorry 🙂 ), they learn English and German. They learn a little bit about history and geography, but a lot of their curriculum is heavily based on Scripture as well as community responsibility. When a person dies in the church district, the children at school will often make a collection of drawings with Bible verses to put in a binder for the widow or widower. They will also visit the sick or disabled or make special gifts for anyone who is hospitalized. At a young age, the children learn the importance of being a supportive member of the community. It is ingrained in their upbringing, first at home and church and later reinforced at school. One of the ways that the Amish encourage this sense of community is through the spoken language used at home and church. Englischers cannot understand it and, therefore, it creates an “unspoken” barrier (pun intended). I remember visiting with my Amish friends about ten or so years back when this became more than apparent. Cat was with me and we had been invited to a picnic at an Amish family’s farm (the Witness farm, as a matter of fact). Cat was running around with two little Amish girls, the three of them were barefoot and playing in the dairy barn, climbing on fences and chasing the baby cows and other barn animals. Somehow she had managed to spend an entire afternoon playing with two little girls that she couldn’t speak to. And while you might argue that this proves the language did not create a barrier, in many ways it did as it ensured that Cat remembered that she was clearly the outsider. She did not belong with the little girls, even though they found a way to play together. Granted, I’d like to think that Cat is an unusual exception since most three and four years old would be intimidated…first by the barefoot through manure issue (Cat always hated wearing shoes) and second by not understanding the little girls (Cat has always been rather independent). I’m fortunate that my grandparents knew Pennsylvania Dutch. My father even used to speak it. I know enough phrases and words that I can pick up the general idea of what people are saying and occasionally I can respond. When I do speak Dutch to Amish strangers, the entire relationship changes. Suddenly, I am no longer the outsider but someone who has cracked the barrier. Returning to the topic of school, the older students help the younger students with all of their studies and also with learning English. It creates a bond between them, also solidifying the notion of community. And not just a one shot deal, but on-going community love and support. Once again, this surely is a lesson that we can learn from the Amish.